Need to train people who to properly document electronically without losing total engagement with the patient. There aretrainings for that. Office staff were very attentive. Need to train people who to properly document electronically without losing total engagement with the patient. There are trainings for that. Office staff were very attentive. This was the best medical visit I’ve ever have. The medical team was kind, efficient, and completely on time. Kimberly wasextremely helpful and an excellent listener and went above and beyond what I thought was possible. I felt very supported and like she actually cared about my concerns and my health. I would highly recommend coming here! This was the best medical visit I’ve ever have. The medical team was kind, efficient, and completely on time. Kimberly was extremely helpful and an excellent listener and went aboveand beyond what I thought was possible. I felt very supported and like she actually cared about my concerns and my health. I would highly recommend coming here! **PLEASE NOTE: ZANE MARTINDALE IS ON PATERNITY LEAVE THRU JUNE 2019. IF BOOKING THRU ZOCDOC YOU WILL BE SCHEDULED TO SEE A NURSE PRACTITIONER (Kimberly Dy or Brett Deutsch) WHO IS UNDER THE SUPERVISION OF DR BERTIE BREGMAN. *We enforce a $40 late cancel/reschedule FEE (24 hr notice needed)* Our physicians are faculty members at Columbia University and certified through the American Board of Family Medicine. There is a strong emphasis in the specialty of Family Medicine on promoting health and preventing disease, and the physicians at Westside Family Medicine are trained to provide complete health care to patients of all ages. A Guide to Services: Same day visits for all issues- well, sick, or unsure! Easy communication w the office via the klara app on our website: wfmnyc.com- no need to wait on the phone forever to reach someone! Comprehensive care for the entire family. Emphasis on disease prevention and health promotion. Newborn, child, adolescent and adult health care. Office-based procedures and diagnostic tests including ekg, spirometry, echocardiograms, nerve conduction studies. Skin procedures such as mole and wart removal and biopsies. Health care for women including pap smears, IUD placement, and annual exams. The support of specialists and services as needed. Saw Kimberly who was, in a word, amazing. Everybody was very professional and very nice and courteous definite recommend to a friends. Long wait in relation to number of patients and time of day. Caring, smart, and compassionate doctor. Cannot recommend him enough. Personable doctor with great advice. He absolutely shows sincerity in everything he does and is knowledgeable about many aspects of general practice. Fantastic Doctor! Sat down and talked to me about nutrition and lifestyle. Really knew his stuff and offered great explanations. Dr. Martingale took the time to understand my medical history, asked lots of questions and seemed to really care. Very friendly and knowledgeable. Wonderful visit and Dr. Martindale is fantastic. Efficient and personable, just like it should be. My favorite doctor. Professional, kind Easily to talk to and is there for his patients not to make a buck. I always feel I am in caring hands with Dr. Martindale. Dr. Martindale is a terrific physician who shows genuine care each time I see him. He asks questions, takes thorough notes, and shares all information necessary that allows me to me sound decisions. I have been fortunate to have him as my PCP the past three-plus years. I was early or I wouldn't have waited at all. Dr. Martindale takes his time, listens and is very thorough. He’s great! Glad I found a fantastic PCP. He was running a bit behind schedule, so he popped in to apologize for the wait. I have not had a doctor do this. He was sweet, knowledgeable and made me feel like I was casually chatting with a friend. Heasked a lot of questions to get down to exactly what I was in for to help find a solution. He is an incredible typer he looks you in the eye instead of his computer screen. Dr Martindale was polite but at the same time he was dismissive of my complaints. He did order some tests (“if you’re really that worried...”) to appease me. The imaging showed I had a DVT (blood clot) in my arm. Heinitiated anticoagulants and then l quickly transferred my care to a specialist. Perhaps I would see him for a wellness check up, but if I ever felt unwell or there was an actual problem, I would not return to him. All the doctors in this practice are friendly and easy to talk to, and we never have to wait to be seen. 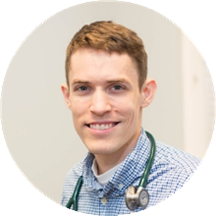 Dr. Martindale is exactly what every other doctor and medical professional should strive to be. He is courteous, understanding and most importantly knowledgeable. Highly recommend him to any one seeking a primary care physician. Super friendly, professional and straightforward. So glad I came to this practice. I was able to connect rather quickly with him. He seemed genuine in wanting to help. I had a great first visit when I came in for my annual physical. The entire staff was efficient and respectful, and I felt totally comfortable the whole time. Dr. Martindale, examined and prescribed medication for an ongoing shaving infection. He diagnosis was thoughtful and his recommendations proved to clear the situation. Highly Recommend! Dr. Martindale was super patient with me and my thousands of questions! I arrived a bit early for my appointment and felt I was seen right away. He was thorough and didn’t make me feel dumb or rushed in any way. Highly recommend him for anyone. Dr Martindale is awesome. Very responsive helpful understanding. I highly recommend him! Very attentive and listened carefully. He is definitely someone I want to see as my primary care physician. i felt comfortable and confident with Dr Martindale in my first visit. He is professional and respectable. This was my first appointment with Dr. Martindale. It was for an annual physical exam. Dr. Martindale was very thorough, clear, kind, and courteous. The staff was also welcoming and very efficient. It could not have been a better first/time experience. Dr. Zane was extremely nice, friendly and courteous. He explained the process and heard me out carefully. Will visit him again in the future. Best doctor I've visited in my whole life. Great bed side manner. Not only was he amazing, the nurses and staff were also outstanding! New PCP! Excellent, he is very professional, and he cares about his patients! Excellent, attentive staff. Dr Martindale was super helpful and really informed. Will definitely return for his services. He's awesome. Never a wait time. Great doctor. Exceptionally professional, efficient and empathic. Highly recommend. I’m short visit was amazing very professional and knowledgeable about medical conditions will be seeing him again ! Dr. Martindale is great! This was my first physical after years, and so I was a little nervous. I think Dr. Martindale is experienced and seems like a caring and good primary care physician. The nurse on staff (Stephanie?) was alsogreat. The only slight reservation I had is that the front desk staff member seemed a little young and needs more training. Great office! Responsive and attentive doctor. Very knowledgeable I’m glad we found him! Very nice doctor. I was in and out in less than 30 minutes for an annual physical visit. I also like their messaging platform Klara. Was seen by the doctor immediately. Everyone in the office was very helpful and nice. Dr. Zane was really friendly, knowledgeable and had great bedside manner. New to the city, and was nice to meet such a great doctor for my first visit.